The Baltimore Ravens are the American football team based in Baltimore, Maryland. The team competes in the National Football League as a member team of the American Football Conference North division. The club plays its home games at M&T Bank Stadium and they are headquartered in Owings Mills. The team was founded in 1996, they are still the new kids on the block in the NFL, however, their work is exceptional. With 20 seasons already played, the franchise won two Super Bowls; one in 2000, and another one in 2012. The Ravens are in the AFC North Division with the Steelers, Bengals, and Browns. Even though the team is still new in the NFL, in their 20 years as a club they have made a name for themselves. The Ravens won 2 Super Bowls, the recent one being in 2012. Also, the team has won 2 Conference Championships, the most recent in 2012. They have won 4 Division Championships, the most, again, being 2012. Furthermore, they have been in the playoffs 10 times- meaning that half of their seasons closed with a performance in the matches. The Ravens have been in the playoffs 3 times in the last five years. One of Raven’s strong points is their defences. They have the strongest defense in the league. With players on defense such as Jernigan and Williams, how could they not be the best! Furthermore, their attacking line is also strong. In the recent 2015-2016 season, the Ravens ended on position 26th in the league. In the 2015-2016 season, the Ravens had scored 328 points for and permitted 401 points against. They collected 5 games and lost 11 matches. This brought their win percentage to .313. 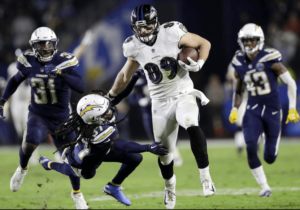 Some key club players to watch are running back Justin Forsett, who is coming after an injury, and Steve Smith, wide receiver. When you bet on the Ravens it is significant to consider their current history. In 2012, the Baltimore Ravens were accurately the best team in the league. They won the Super Bowl and they also had a great roster. Since then, they have had members leaving due to injuries, and they haven’t been able to get back into their normal 2012 stride. 201 was not that long, and they had managed to win. So, we believe they can still come back and win again.